You are here: Home / Blog / The Sun & The Moon – Perfect for Aviation Photography. The Sun & The Moon – Perfect for Aviation Photography. Our evening photo shoot on Saturday was a great success and we couldn’t have asked for better weather. With a lovely early spring sunset, followed by a huge full moon, enhanced by the fact that it was at it’s closest to Earth for 18 years, made it a perfect evening for photography. Our Dakota had it’s first public outdoor viewing since completion and this year for the first time, we were able to offer elevated viewing platforms to enable overhead photography of the aircraft. 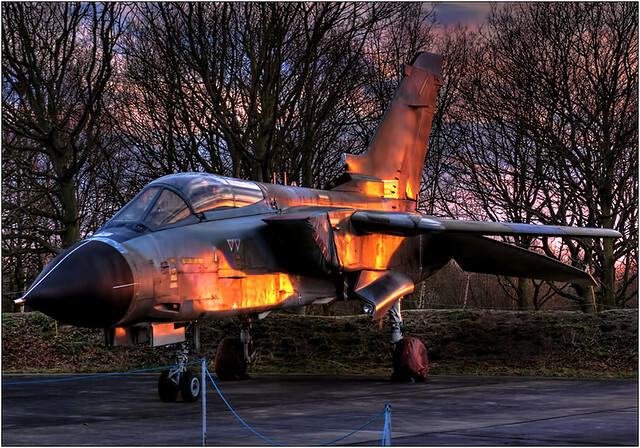 This lovely pjotograph of our Tornado GR4 by Les Auld was shot using the last of the sun’s light and shows what a lovely evening it was. If you were with us on Saturday, you may not know that you can upload your images to Flickr and display them on our group page here. Once again, we would like to thank everyone for their involvement and look forward to seeing you all again throughout the summer.